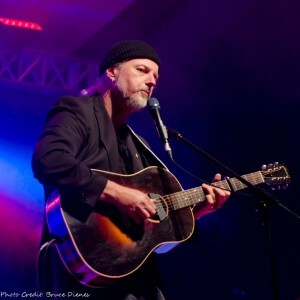 Born in Hamilton, Ontario to parents of Nova Scotian descent, Garnet Rogers spent many hours in front of the old floor model radio listening to Grand Ol’ Opry broadcasts and harmonizing with his older brother, Stan. Two years later, Garnet was playing the definitive 8-year-old’s version of “Desolation Row” on his ukulele. He soon started teaching himself to play flute, violin and guitar. At age 18, Garnet was on the road as a full-time working musician with Stan. Together, they formed what is considered one of the most influential duos in the history of North American folk music. Garnet and Stan toured and recorded together from 1973 to 1983, when Stan died in a plane crash. Since that time, Garnet has established himself as a formidable solo artist. With a smooth, dark baritone voice, an extensive vocal range and thoughtful, dramatic phrasing, Garnet is one of the finest singers anywhere. Backed by his consummate guitar skills, his songs are literate, passionate, sensitive and purposeful. Cinematic in detail, his songs give expression to the unspoken language of the heart. In performance situations, his over-the-top humor and lightning-quick wit move his audiences from tears to laughter and back again. Garnet has been featured on Much Music, Mountain Stage, All Things Considered and many other television and radio programs. He has headlined numerous festivals – including the Ottawa Grassroots Festival – and has been featured at prestigious venues such as Wolf Trap, The Lincoln Center and Art Park. “Night Drive”, Garnet’s new 735-page book about his travels with brother Stan, was published by Tickle Shore Publishing (2016).